Adjustable, elastic back allowing a custom fit, as well as side vents and a 2-way zip. Ultra suede collar and antique brass horse head buttons create and elegant look at a great price. Water resistant outer and a warm fleece lining and a concealed hood. 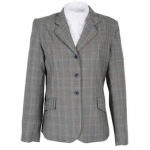 Beautifully fitted ladies competition jacket, designed and crafted with the closest attention to detail. This jacket has fashionable zip pockets and a vent in back for comfortable riding. 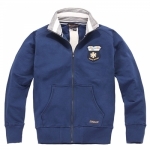 Provides the perfect amount of comfort and warmth, 100% polyester. A classically styled hunt coat in a beautiful grey plaid with light blue highlights. 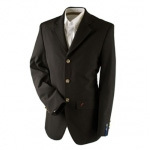 Easy-care traditional 3-button child&apos;s show coat. Classically designed 3 button show coat with plaid micro polyester, retains it's crisp look, machine wash.
With a look of elegance and a simple touch of style - the Shadbelly is crafted with a modern stretch material, allowing for superb movement and comfort.